Fall is back again and the fashion industry is filled with many campaigns, runway sessions, as well as the wardrobe update. These days, online shopping help us to get all we need without even going out of the house. Dresslily for instance, have all the latest arrival in affordable price. One of the must have is surely sweater dresses for fall and they have various version for it. Read on to find out more about my picks! Some of the fall must have includes the fashion staples, but some will surely add some oomph in your wardrobe. 1. Hooded Drawstring Jacket. Utility jacket is super "in" at the moment. Pick one with rather structured fabric to add some edge. 2. Basic Turtleneck. 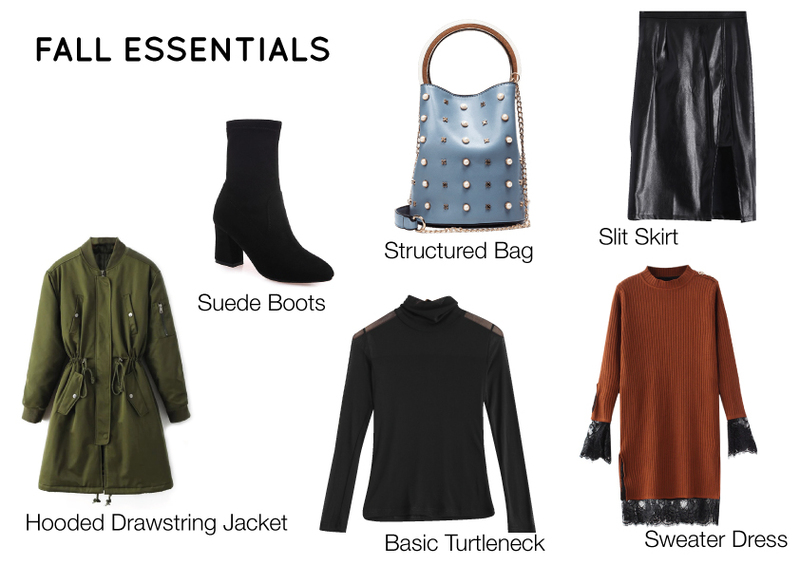 There is no doubts that everybody need a basic turtleneck because it is versatile to be paired with many types of skirt or denim. 3. Suede Boots. Since the air is getting chill, wear a pair of comfortable boots on the go. 4. Structuredd Bag. Bag with metal handle, structured shape, and embellishment is one of the hottest item on the runway. Make usre to snag one! 5. Sweater Dress. Sweater dresses are perfect for the lazy dress up days. Eventhough it looks simple, but it is still making you look polished. 6. Slit Skirt. A skirt with thigh high slit will add a sensuous touch. Besides that, leather skirt is back in trend, why don't you wear it now? Those are some of my wishlist for this season. Anything you're eyeing for this fall?